The LC 500's visual appeal is defined by an athletic aerodynamic shape and sensual curves, Lexus says. DETROIT -- Lexus is positioning its new LC 500 coupe as a niche nameplate with a bold message to the industry: After more than a quarter century of reaching, the brand has finally earned a place alongside the Germans in the upper echelons of the luxury market. The low-slung, rear-wheel-drive coupe shows that Lexus intends to compete with BMW, Mercedes-Benz and Audi not just for volume but also for glamour, power and prestige. It will crank 467 hp out of its 5.0-liter, V-8 engine. 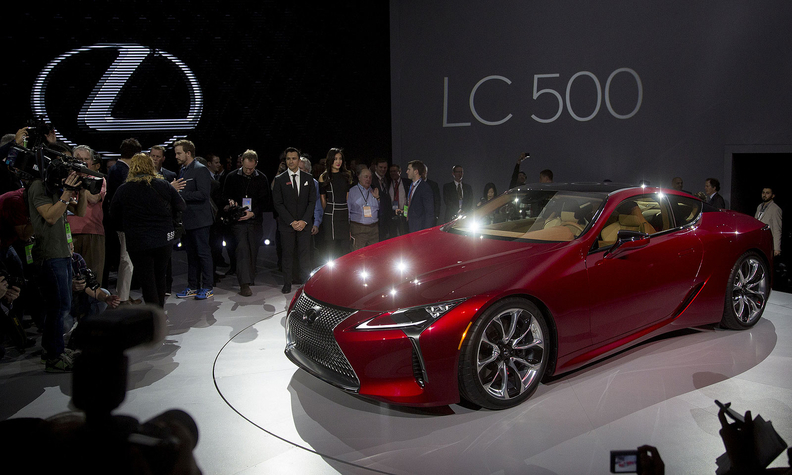 The LC 500 was unveiled at the Detroit auto show on Monday. It is based on the LF-LC concept coupe and rides on a new modular rear-wheel-drive platform called GA-L (global architecture for luxury vehicles), which will underpin future versions of Lexus’ sedans, starting with the full-size LS. Lexus is looking for the LC 500 to deliver a bold message to the industry: After more than a quarter century of reaching, the brand finally has earned a place alongside the Germans in the upper echelons of the luxury market. "The LC 500 has been an important product for Lexus and me personally," Toyota President Akio Toyoda said in a statement ahead of the car’s Detroit debut. "A few years ago, we decided to guide the future of the brand with products that had more passion and distinction in the luxury market." Lexus has struggled to break into that rarefied tier where prices hit six digits and luxury brand images are defined (the limited-run LFA supercar notwithstanding). With a high-end model such as the LC reinforcing a sense of elitism, the hope is that this air begins to permeate the Lexus lineup. Unlike the one-off LFA -- which ended production in December 2012 -- the LC 500 uses components shared with other Lexus vehicles. It shares its naturally aspirated 5.0-liter V-8 engine with the GS F high-performance sports sedan and RC F coupe. Forgoing the dual-clutch transmission found in many of its expected competitors, the LC 500 will use one of the industry’s first 10-speed automatic transmissions. Lexus is targeting a 0-to-60-mph acceleration time of less than 4.5 seconds. Despite the inevitable comparisons to other grand-touring coupes, such as the Jaguar F-Type or the Porsche 911, the LC 500’s 113-inch wheelbase puts it closer in size to the Mercedes S-class coupe or the BMW 6-series coupe. Lexus didn’t release the car’s curb weight, but the automaker is aiming for 4,200 pounds. That’s about 500 pounds lighter than the S-class coupe (which is all-wheel drive) and just about on a par with BMW’s rwd 650i coupe. Weight has been shaved with aluminum door skins mounted to a carbon-fiber door structure and an available carbon-fiber roof (a glass roof is standard). Weight distribution will be 52/48, according to Lexus. Other goodies packed into the LC include an active exhaust system, an available active rear spoiler and 20- or 21-inch alloy wheels. The LC 500 is expected to go on sale in in the spring of 2017 with prices starting at just under $100,000 in the U.S. Variants such as a convertible, V-6 or hybrid model also are likely.